In conversation with Fatima Bhutto about her new novel, 'The Runaways', and the alienation that drives radicalism. 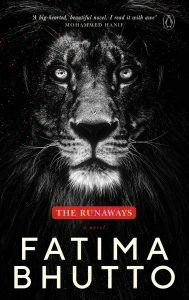 Radicalisation, alienation and belongingness – these are the main themes of Fatima Bhutto’s new novel, The Runaways. The novel traces the lives of three young people – Anita, Monty and Sunny – who escape their lives in Pakistan and run away to Iraq during the ascent of the Islamic State. The main theme of your book is radicalisation. Was it the sudden rise of ISIS that drew you to the subject – or was it developments closer to home, in Pakistan, because of which so many Pakistanis have suffered? I write because I am disturbed by something enough that it doesn’t let go of me. I am 36 years old, so I remember a time before the ‘war on terror’ had subsumed everything – when the colour of my passport or my religion wasn’t a ticking threat to most people. But a generation of young people have come of age under this oppressive shadow. Pakistanis have certainly suffered. What can you say to the fathers and mothers of those boys whose blood covers this country? What can you say to Aitzaz Hasan’s family? He was killed protecting 2,000 fellow students from a suicide bomber, using his body as a shield. I am heartbroken that such a sacrifice is paid by the young and the innocent over and over again. The West doesn’t understand the pain of the non-western world. They have constructed a completely false narrative about radicalism, which conveniently excuses their wars, their occupations, from any role in its creation. You write a novel for many reasons, these are just a few of the things that were on my mind when I sat down to start. The three protagonists come from different economic and religious backgrounds. Do you believe that a rich Muslim teen today is just as prone to Islamic radicalisation as a poor Christian girl like Anita? I wouldn’t call it ‘Islamic’ radicalism at all. Look at the world today – radicalism isn’t the exclusive property of one people or one religion. Young people are vulnerable to anger and violence all over the world. Radicalism is a reaction spurred by nationalism more than any religious belief – studies have shown this to us again and again. A University of Chicago professor studied every case of suicide terrorism in the early 2000s and found that they were motivated by political beliefs, not religious ones. Look at the 28-year-old terrorist who killed fifty people in New Zealand – it was politics and his hateful interpretation of nationalism that motivated his violent actions. The stories of your three main characters are very similar to that of Shamima Begum, the British teenager who chose to join the Islamic State. Many in the UK opposed her right to return, saying she didn’t deserve any form of amnesty. In the ‘Runaways’, Sunny is aware of the extreme nature of his decisions, but voluntarily chooses the same path that Shamima did. What do you think is the right way to deal with these young people? Look, Shahmima Begum was born in Britain, raised in Britain, educated in Britain and radicalised in Britain. Britain is a part of her journey towards the catastrophic decision she made to run away. How can it wipe its hands off her? She is a citizen and she has rights. They have a responsibility to try her if she has committed a crime and to rehabilitate her and understand why this happened in the first place. How is a 15-year-old allowed to board an international flight without a passport? Where were the adults, the authorities to ask, ‘Where are you going?’. I understand she has expressed regret, and she has lost three children before they could walk and talk – I think she has suffered the incredible error of her choices. These young people, lonely and angry enough to turn against the world, need to be treated with compassion before they make these terrible mistakes. These young people, lonely and angry enough to turn against the world, need to be treated with compassion before they make these terrible mistakes. In Sunny’s case in ‘The Runaways’, it’s not the first choice he makes. He tries to find a place, a community that will absorb and understand him but he doesn’t find it. That’s partly why he makes his terrible choice. Sunny’s incapable local Imam, who fails to see the signs, Anita’s poverty due to the structure of capitalism, and the West’s ‘war on terror’ (described through one character’s arguments)— are these the main reasons that radicalise young people today? I think they are a huge part of why young people are so vulnerable today. It’s not religion. That’s what the talking heads in the West keep telling us but they have no experience of what it means to be a Muslim, let alone any actual understanding of Islam. The West’s war on terror has been hypocritical and it’s been phenomenally bloody. Look at any Western country today – what are they talking about? Migration. They’re terrified of outsiders, but why? These are countries that colonised the world for hundreds of years – hundreds – and now they are completely destabilised by some of those people coming to their shores to live and work? Look at the rising intolerance all over the world: the racism, the exclusion and ugliness in the rhetoric of world leaders. This is alienating, but it’s also humiliating, it’s wounding. Again look at the New Zealand shooter – he is a completely radicalised man. He’s not a Muslim. He’s a fundamentalist and a terrorist who took life into his hands in a brutal way. Why do we only talk about radicalism as though it’s the property of one people? Why did you choose to select the jihad-camp setting, all the way in Iraq? Why not closer to home? Are you deliberately looking the other way, denying the presence of terror camps in Pakistan? The story I’m telling in ‘The Runaways’ is about a particular moment in radicalism that pronounced itself as very young, very modern, and very global. My novel is about Daesh and the casualties of this transnational blaze of radicalism, not about Pakistan. Secondly, a novel is a work of imagination – it’s not a non-fiction history or investigation that is obliged to do anything, so your question is perhaps better directed to a non-fictional work. What do you think is the role of Prime Ministers like Narendra Modi and Imran Khan to address this kind of radicalisation and alienation? The job of any leader is to provide a vision for the youth of his country and to make sure that they are included in the construction of that vision. When people have dignified work, a home, a feeling – that of security that comes from knowing they are a vital part of the fabric of their country and community – they don’t run away to die. They don’t pick up arms if they are assured an honourable life in their home countries. Intifada P. Basheer is a freelance journalist based in Delhi. She tweets @IntifadaBasheer.